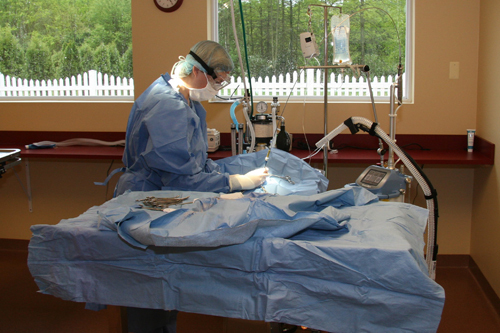 A CO2 Surgical LASER can be used during almost every surgical procedure. In 1917 Albert Einstein first described the concept of LASER. But it wasn't until 1960 that lasers were first used for surgical procedures. There are many different types of lasers for use in industry and medicine. Some lasers can cut through inches of steel; others are used on the cornea- one cell layer at a time. ​CO2 lasers vaporize water. Since most tissues in the body have cells full of water; a CO2 laser is ideal to use in surgery. The laser is a "tool," just like the scalpel blade. It takes time and experience to become familiar with how to safely and most effectively use the tool. A laser machine has infinite combinations of wave-forms, power settings and pen-tips for use on different tissues and for different patients. The settings and skills needed to remove a stray eyelash follicle on a Pomeranian is much different than that needed to make a large incision through the thick skin of a Rottweiler's neck. What types of Surgeries can be done with LASER? The laser is a "tool" just like a scalpel blade, so almost any surgery that can be done with a scalpel, can be done with a laser. The benefits of the laser include less pain, less bleeding, less swelling. With a laser you can also achieve pin-point accuracy to achieve closer margins, you can also ablate (or vaporize) one layer at a time. 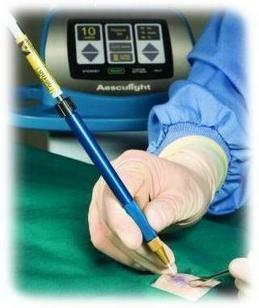 Lasers also sterile the incision area, by vaporizing bacteria, decreasing the risk of contamination. 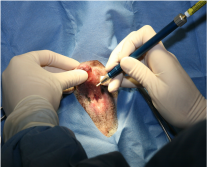 Stenotic Nares- The laser can trim the nares and will efficiently control bleeding. 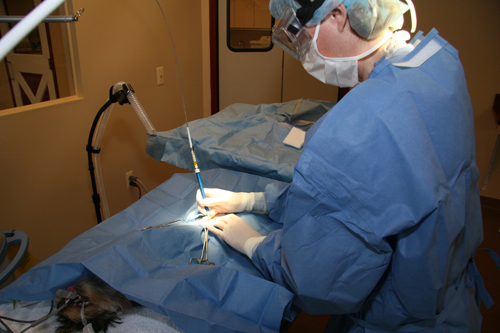 Elongated Palate- Using a special "back-stop," laser can be used to trim the palate. Distichia- Laser is used on a single point to destroy the hair follicles of stray eyelashes. Meibomian gland tumors- Tumors along eyelid margins can be vaporized or closely excised. 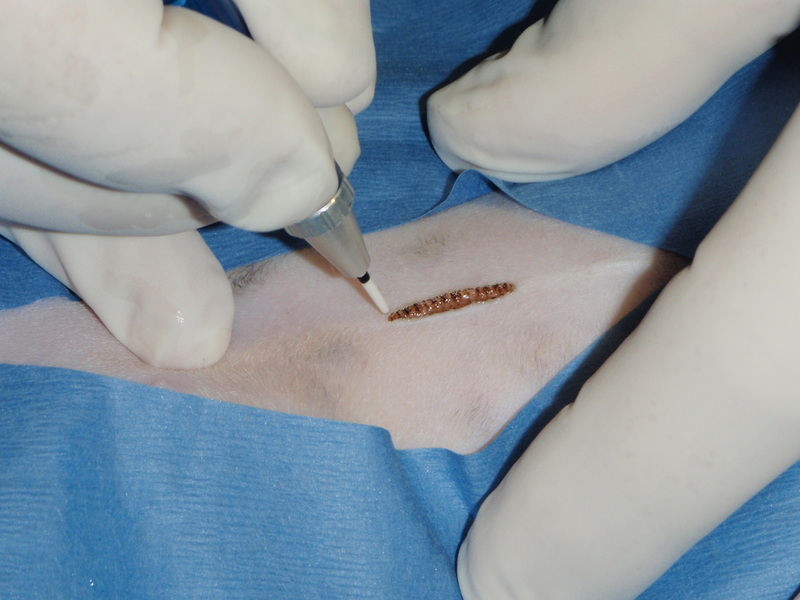 Skin tumors can be in "difficult" areas, where there is not a lot of loose, extra skin to close the area where the tumor was removed. The laser can provide close margins, sparing valuable skin. The laser is used t cauterize tiny vessels as it cuts, reducing the need for tissue-crushing hemostats and excessive suture usage. 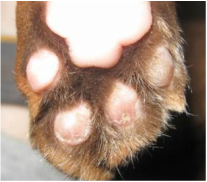 The decision to de-claw a cat is a difficult one for many owners, but the laser means no tourniquets, no bandages, and just a drop of surgical glue instead of sutures. 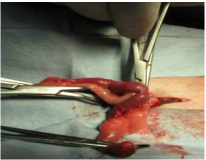 Cats are walking on their feet 30 minutes after surgery.